(providing G-code simulation but no realtime machine control). Does it mean i won t be able to manage my cnc? or how should i configure it? Thanks for yout time. You seem to be doing a number of parts of different procedures. You can either build all of LinuxCNC from source after adding your new kinematics file to the correct folder and to the makefile. This is the hard way and it sounds like you did about half of it. _Or_ you can simply compile and install the new kins file from anywhere (including in your home directory) into an already-installs LinuxCNC with the "sudo halcompile --install mykins.c" command. Try that, and if it doesn't work then tell us the exact error messages. Hello, I was trying to do the sudo halcompile --install corexykins.c in my linuxcnc configuration folder which I made with step conf. But after doing that step, I get this message. Fyi = I am running a live version of the Debian Wheezy with linuxcnc 2.7 and rtai kernel. 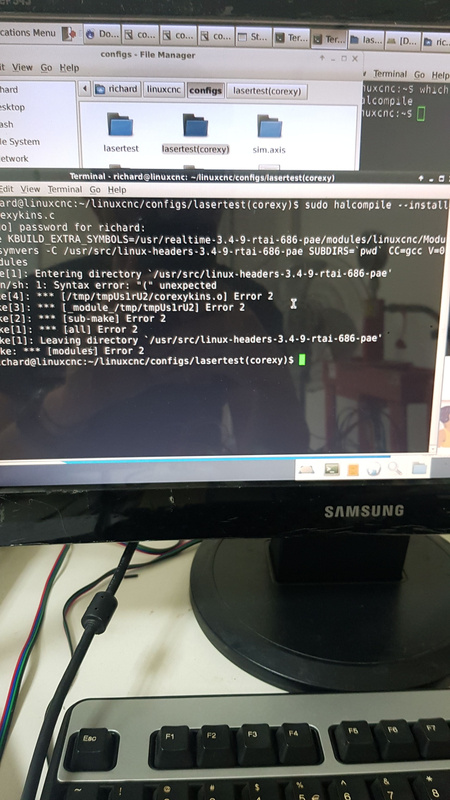 I wasn't able to download some repo and linuxcnc -dev, but then I change the sources of my debian wheezy to archive, and my buildbot linuxcnc to become buildbot linuxcnc with master-rtpreempt. That appears to be a problem in the .c file, other than that it looks like halcompile is all installed and working. andypugh wrote: That appears to be a problem in the .c file, other than that it looks like halcompile is all installed and working. Actually I took this corexykins.c from the internet as a sample, so I haven't done anything with this file. I've already included the loadrt corexykins in the .hal file. May I upload the code here so that you can do a little inspection and teach me sir?